Existing smartglasses like Google Glass put some neat camera and voice recognition features right in front of your eyes, but they have a ways to go before they provide true augmented reality experiences. Optinvent is looking to move closer to that future with its ORA-1. 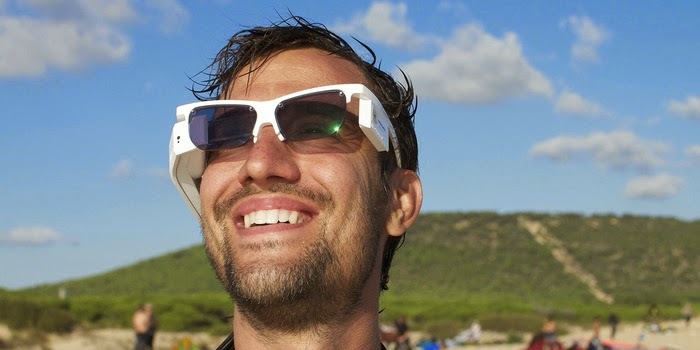 This Android-based pair of smartglasses promises rich AR experiences and wide app compatibility. A developer version of the wearable has hit Kickstarter, where you can pre-order a unit starting at $300. The ORA-1 packs a bit more bulk than Google Glass, sporting thick frames that house a pair of see-through photochromic lenses that darken when exposed to sunlight. A panel on the right side hosts a trackpad, camera and light sensor, with the device's battery stored on the left. MORE: Will Wearables Replace Your Smartphone? One of ORA-1's standout features is its ability to run lots of Android apps natively. The current list of ORA-1 ready apps includes dedicated AR experiences like Wikitude, Layar and AR Invaders, as well as common smartphone social apps like Twitter, Facebook and Foursquare. Another highlight is the headset's dual modes. You can use the ORA-1 in Augmented Reality mode to get a view full of your apps and notifications before your eyes, or lower the projector for Glance mode, if you'd rather the AR content not distract you and only occupy the bottom portion of your field of view.